Long-lasting hold engineered for a man's styling needs, with no stiffness or sticky feel. Advanced pump is designed for even coverage. VOC 55%. Comb or blow dry hair into your desired style. Spray 5 inches - 7 inches from hair with short, even bursts. Note: If nozzle clogs, rinse with warm water. 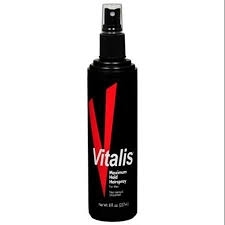 To keep hair strong and healthy, use Vitalis 2-in-1 Shampoo and Conditioner. CONTENTS FLAMMABLE. DO NOT USE NEAR FLAME. DO NOT SMOKE UNTIL HAIR IS FULLY DRY. AVOID SPRAYING NEAR EYES. KEEP OUT OF REACH OF CHILDREN.